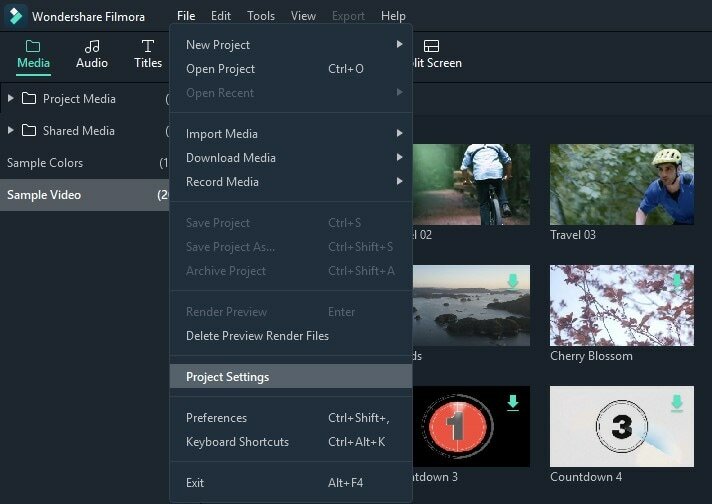 For every project you create, Filmora9 creates a project file (.wfp). This file contains the settings you select for each sequence in the project, as well as editing decisions, effects, and music used in the project. 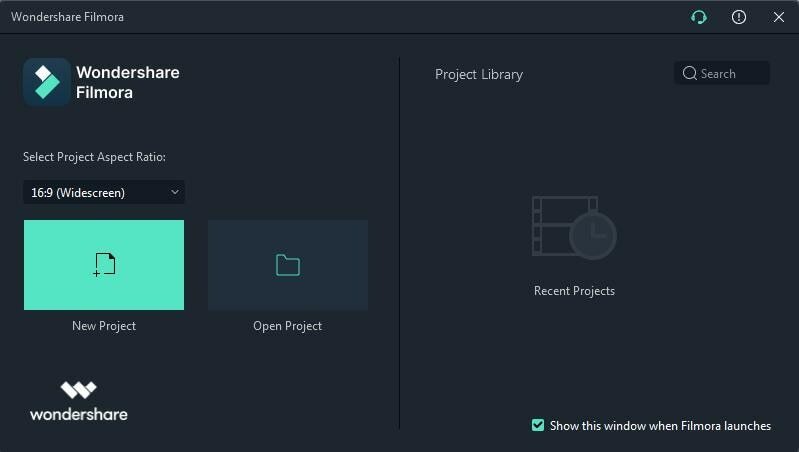 Filmora9 project files don't store video, audio, or image files. They store only a reference to these types of media files based on the file names and locations. 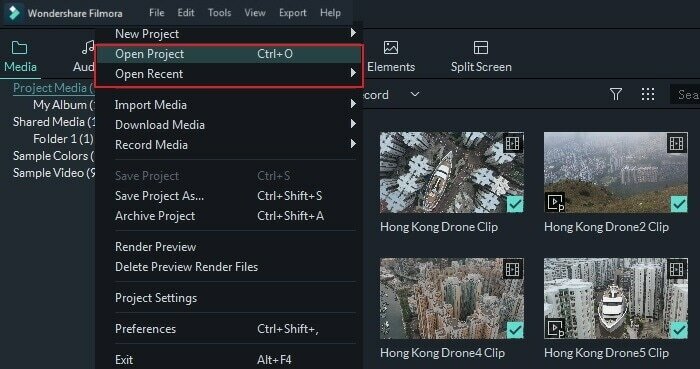 If you move, rename, or delete a source file, Filmora9 won't be able to find it automatically the next time you open a project that uses that piece of media. For convenience, Filmora9 offers you the option of archiving your source files all together with the project. Launch Filmora9 and choose New Project. 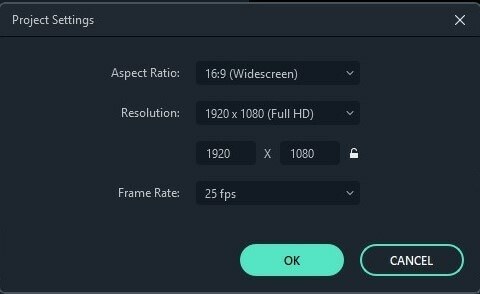 You can customize the resolution, aspect ratio, and frame rate of the project by going to File > Project Settings. The default aspect ratio is 16:9, but you can change it to 1:1 or 9:16 if you want to make videos for Instagram or other social media. Click File > Save Project or Save Project As, or use the hotkey Ctrl+S. Your project will be saved as a file with the extension .wfp. These files can only be recognized by Filmora9. 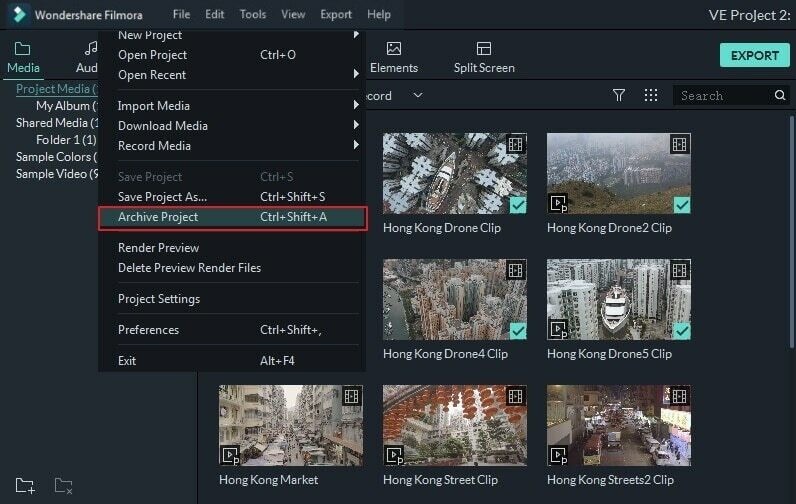 When you launch Filmora9, your most recent projects will be shown in the Project Library. Select the target project to reload the .wfp project file. 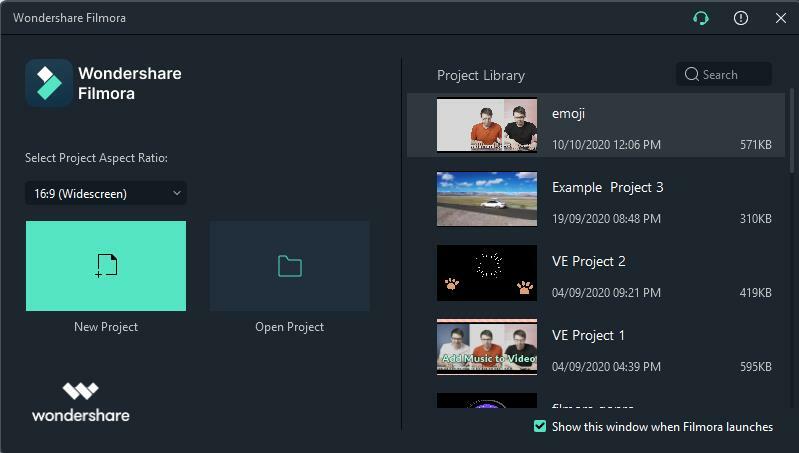 If your project isn't shown in the Project Library, click Open Project to locate it. 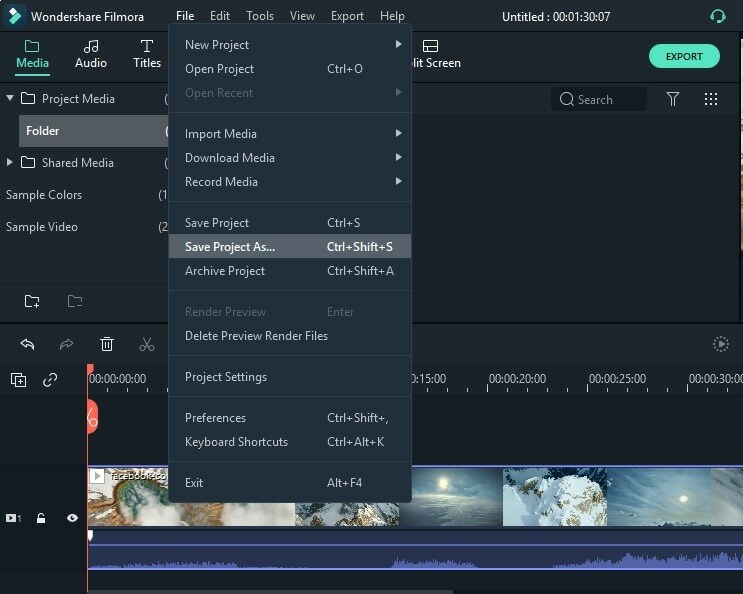 Besides opening projects at the beginning, you can also open an existing project when editing. Click File and you can choose Open Project (ctrl+O) or Open Recent to locate the .wfp file. Click File > Archive Project or use the hotkey Shift+Ctrl+A. The project file and the source files will be archived together in the *.wfp format so they can be easily moved to another computer or storage device. To open the .wfp file you just need to double click on it. 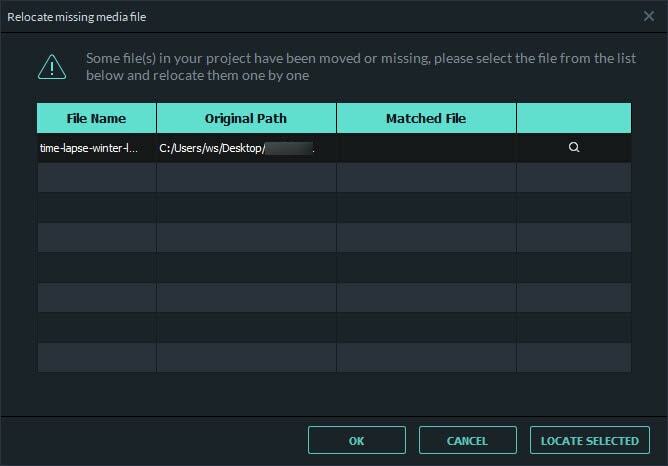 Once you change the location of the source files, rename them, delete them, or disconnect the external drive where they are saved, Filmora9 will not be able to find them. Instead, you will be shown windows with the locations from which the files are missing. Click the magnifying glass icon to relocate the missing files and then press OK to reopen the original project. If the files have been permanently deleted, you can choose other files as replacements.